I’m not going to pretend that this blog post is a properly impartial review – I know the authors of both of these books to varying degrees – but I thought it was worth writing a few words on two new books I’ve acquired recently which are worth additions to any Power BI enthusiast’s bookshelf or e-reader. Something I’ll never understand about my friends Marco Russo and Alberto Russo is their love of writing books – they generally have a new one out every year, sometimes two (personally I find writing books painful). Their latest publication is “The Definitive Guide To DAX” and it does indeed live up to its title. No-one outside the dev team comes close to Marco and Alberto’s knowledge of DAX, the language of Power Pivot, Power BI Desktop modelling and SSAS Tabular, and in this book they have documented everything that they know about it down to the smallest detail. Want to know what the KeepFilters() function does? Or the GenerateAll() function? How about all the new DAX functions and features in the latest versions of Power BI Desktop which will also appear in SSAS 2016 Tabular? They’re all here, and more. As such this is essential purchase for anyone doing serious work on the Microsoft BI platform, although probably more as a reference than a book to read end-to-end. It’s fair to say there’s a certain amount of overlap between this and some of their previous books on Power Pivot and SSAS Tabular, but the language – and the community’s understanding of it – has evolved sufficiently to justify buying this book too. As the author of the only other book on Power Query, I suppose I should really be keeping quiet about “’M’ Is For Data Monkey” in case you buy it instead of mine. However 18 months of UI changes and functionality improvements mean my book is now a bit out-of-date, and what’s more important is that Ken Puls and Miguel Escobar have had the advantage of a lot of real-world experience with Power Query that I didn’t have (indeed no-one had) when I was writing in early 2014. 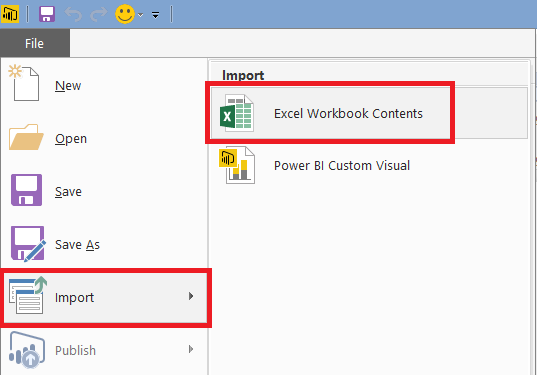 The book itself is not a formal introduction to the M language but a guide to what you can do with it in Power Query; while a lot of what’s here will be useful in Power BI this is definitely a Power Query book and the target audience is Excel Pros rather than BI Pros. The decision to focus on Excel Pros was a good one to make, in my opinion, because it plays to the authors’ strengths and means that the book has a very practical focus. A lot of the tips and tricks here are ones I’ve used successfully myself, and I don’t mind admitting that I learned one or two things from this book as well. There are a couple of other new books out that, although I haven’t seen them, will also be worth checking out. 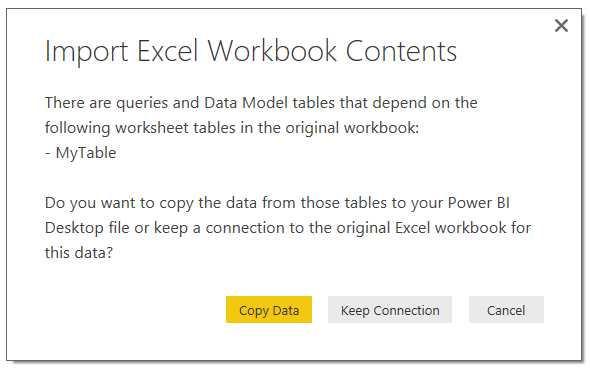 Rob Collie has just released Power Pivot and Power BI, essentially the second edition of DAX Formulas For Power Pivot; Matt Allington has just released Learn To Write DAX; both are going to be good choices for Excel users wanting a DAX tutorial. 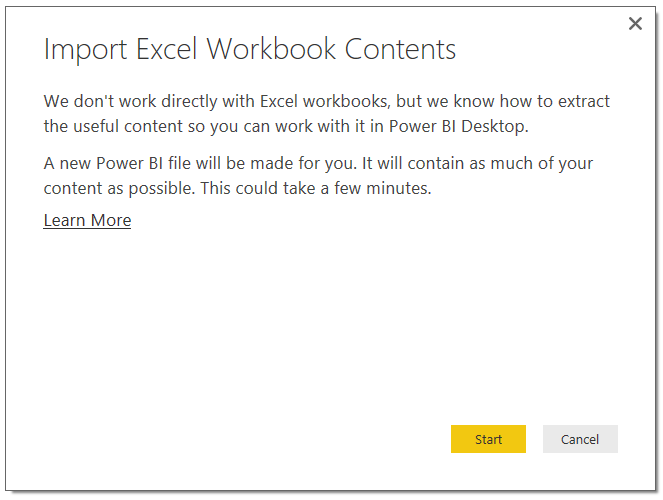 Finally, last week Teo Lachev announced on his blog that he has published the world’s first dedicated Power BI book. Teo is another author whose books I admire so I’m sure it will be excellent, although I’ll be interested to see how he handles the problem of writing about a product that changes so much so quickly. 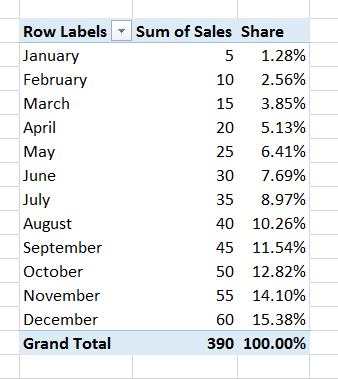 Recently I came across a problem where a DAX measure gave different results in Excel and Power BI Desktop. It turned out not to be a bug or even a feature, but since it confused me for a few minutes I thought it was worth writing up in case anyone else ran into it. 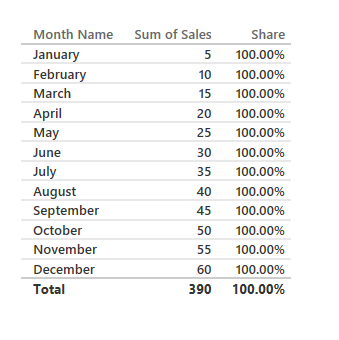 On the rows axis, as you would expect, the only hierarchy you see is Month Name. 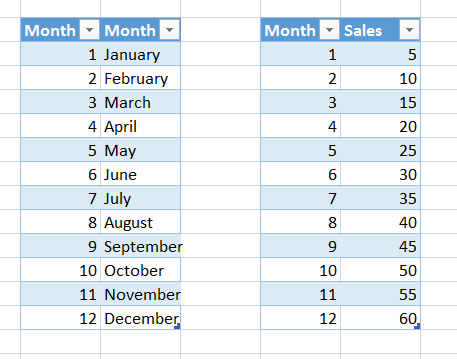 The difference here is that the Month Number and Month Name fields are both present – they have to be since the query has to sort by Month Number. In MDX the order of members on a hierarchy can be set inside the model; in a DAX query you can only sort using an ORDER BY clause and for that to work, the field you’re ordering by must be present in the query. 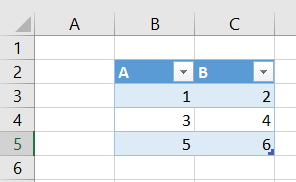 That big chunk of text in the middle of the Source step is the data from the Excel table stored as a compressed JSON document, and again Binary.Decompress() is used to extract this data. 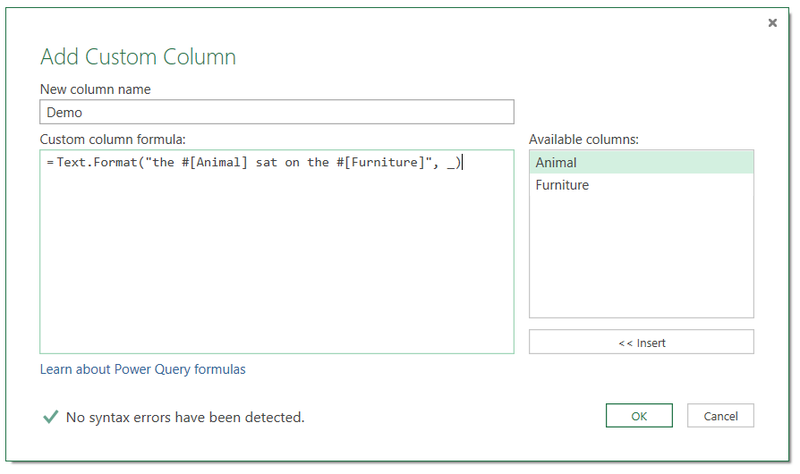 New functions are appearing in M all the time, many with no announcement or documentation. I came across Text.Format() the other day and I thought it was worth blogging about because I can see a lot of uses for it: it makes it very easy to insert values into a piece of text. Remember, if you do something like this you’ll probably want to disable native database prompts – if you don’t, you’ll be asked to approve every new query that gets run. Also, you’ll notice that I’m using the StrToMember() function with the Constrained flag in the WHERE clause because, even though it’s not really necessary, it’s good from a security point of view. It would be really good if we could use proper MDX parameters in our queries but I don’t think it’s possible, unless there’s some other new feature or function that I don’t know about.